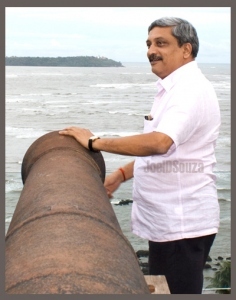 Defence Minister Manohar Parrikar on Tuesday tore into Aam Aadmi Party which is trying to make inroads into Goa ahead of Assembly polls, saying "some people are eyeing Goa after looting Delhi" even as he virtually compared the Arvind Kejriwal-led party with "monsoon grass". "Some people in Delhi are upset with my frequent visits to Goa because they fear that I will upset their ambitions to win elections in this state. After looting Delhi, they are now eyeing Goa," Parrikar said without naming AAP during a civic reception function to mark 60th birthday of Chief Minister Laxmikant Parsekar. And you are distributing 3 bulbs to each people in goa when kashmir is burning .On holiday trips to goa every week..Shame on this defence minister.Should be made minister for tourism or pm should have a new ministry i.e. ministry for distribution and have this u turn specialist head it. Please read the following report card! However, the BJP itself gives no account of the staggering ₹714,28,57,813 that it reported as “expenditure” in the Lok Sabha elections in May 2014 and the Assembly elections in Andhra Pradesh, Arunachal Pradesh and Sikkim held simultaneously. This sum of ₹714,28,57,813, was listed by the Election Commission (EC) as “expenditure expense” by the BJP. But the party does not disclose where this money came from. According to the Association for Democratic Reforms and the Election Commission, the BJP is yet to submit its donations report to the EC. The AAP, on the other hand, not only reports each donation made on its website but has also submitted its contribution report for fiscal 2013-14 to the EC. The report, which lists each donor who has made a contribution of over ₹20,000 to the party, was submitted to the EC on September 30, 2014. Not only does the BJP not disclose who its donors are, it so far has thwarted institutional efforts to make election funding more transparent. Like parties such as the Congress, BSP, NCP, CPI and CPI(M), the BJP has refused to follow the EC’s order dated June 3, 2013, which declared them as public authorities and asked them to appoint Public Information Officers to attend to RTI queries.